Not so long ago, before video games and the internet entered the world, it was considered right and proper for children to learn an instrument, and whichever household had enough room, a talented musician and a piano quickly became the central gathering place in town. In an effort to promote piano-playing as hobby and household entertainment, Roland Corporation U.S. held their first annual Piano Festival, which culminated in the National Finals on November 13, 2010, at Roland U.S. Headquarters in Los Angeles, California. After the accordion competition with the FR-7V, the organ competition with Roland's AT-900 Organ, it was only a matter of time before they held a piano festival, and as with the other two, the show was a big success. It started with regional Roland Piano Festival events held at select Roland piano dealers across the country in the spring and summer of 2010. Dealers hosted these local events in their community, giving hobbyist players and students the opportunity to share their musical talents. Competitors participated in one of four different divisions: Youth 1, Youth 2, Youth 3 and Adult Hobbyist. The top winners in each category advanced to the National Finals in Los Angeles. 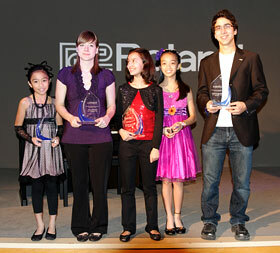 Finalists performed on the Roland RM-700 Digital Piano in front of a live audience of family and friends. They were then critiqued by a panel of expert judges--concert pianist Yana Reznik, musical director, keyboardist and composer Paul Mirkovich, and GRAMMY® Award-winning jazz pianist David Benoit. Winners included nine year-old Madeline Magana from Maple Valley, Washington, in the Youth 1 division; 11 year-old McKenzie Fysh from Renton, Washington, in the Youth 2 division; ten year-old Keenan Monks from Hazleton, Pennsylvania, in the Youth 3 division; and 19 year-old Nicole Ventresca from Bellingham, Washington, in the Adult Hobbyist Division. Each winner went home with a CD-2i SD/CD Recorder. The afternoon included a special live performance from David Benoit, who performed "Downtime," a new piece from his latest release, Earthglow, and "Linus and Lucy" by Vince Guaraldi, because who doesn't smile when they Charlie Brown theme starts playing? Awards were presented by President and CEO of Roland Corporation U.S., Chris Bristol, who had glowing comments about the performers and explained the motivation behind the Roland Piano Festival. "Watching the folks perform, I thought to myself, 'What a magical afternoon,'" he said. "It's a wonderful thing to be involved in music, and festivals like these are a way we can share the joy of creating music with each other." The participants and the parents alike were thrilled with the event, and the inspiration it provided to the participants to keep playing piano. "Sydney had the time of her life and met so many great people; many of whom she plans on keeping in touch with," said Teresa Johnson, mother of Sydney Johnson. "We had another finalist on our return flight and they have become fast friends. This experience will be something that she and I will treasure for years to come. This has inspired Sydney to play hard and to focus on what she may be able to accomplish in life through music." Of course, Roland is already planning the 2011 events, and it looks to be even bigger than the first, so check it out! For more information on becoming a participant or hosting a regional event for the 2011 Piano Festival, please email: info@rolandpianofestival.com. Got questions? Comments? Want to talk piano-playing history? James can be reached as ShackMan in the Music Gear Review forums, or you may e-mail him at James.Rushin@MusicGearReview.com.